Philander Hinshaw, age 24, born in Indiana; carpenter; $100 real estate; $100 personal property. Emma Hinshaw, age 22, born in Indiana; keeping house. 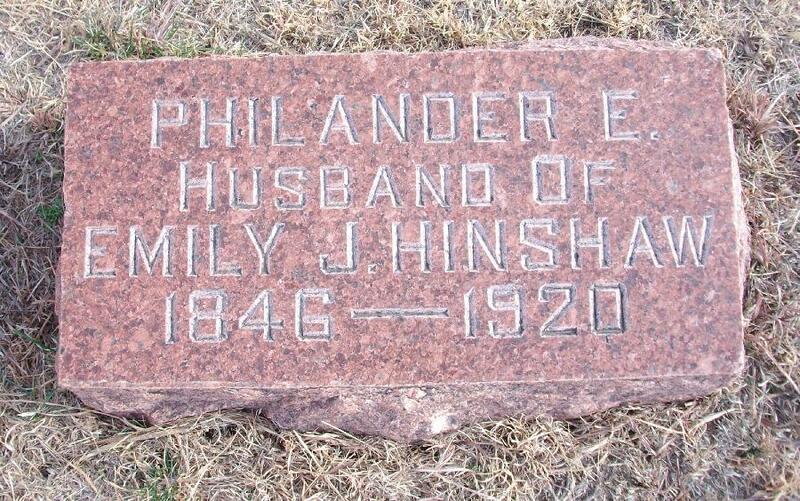 Hinshaw, Phil[..unclear..], head-of-household, age 53, born [..month uncear..] 1846 in Indiana; parents born in Indiana; married 30 years; occupation: farmer; owned farm (free). 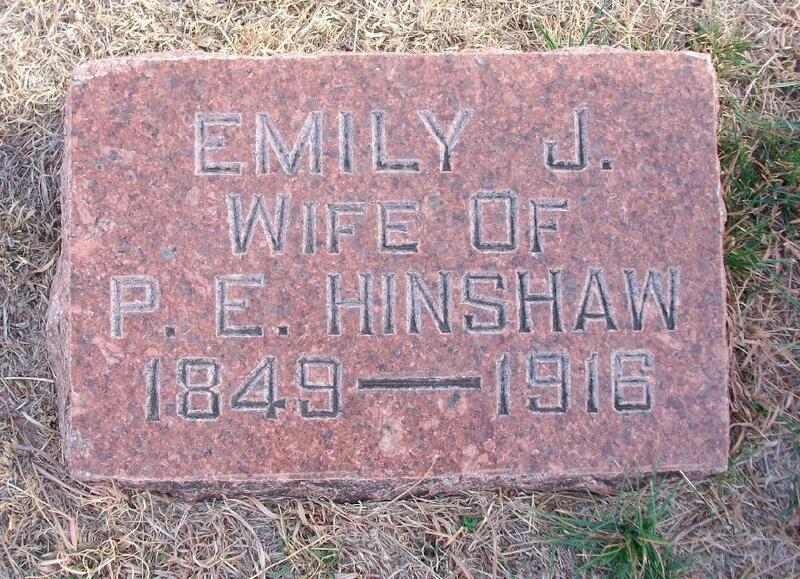 Hinshaw, Emma J., wife, age 51, born Jan 1849 in Indiana; parents born in Indiana; married 30 years; 10 children, 9 living. Hinshaw, Frank S., son, age 19, born Sept 1880 in Kansas; parents born in Indiana; occupation: farm labor. Hinshaw, Mary J., daughter, age 17, born Oct 1882 in Indiana; parents born in Indiana; occupation: school teacher. Hinshaw, Walter E., son, age 15, born Jan 1885 in Indiana; parents born in Indiana; attended school 4 months. 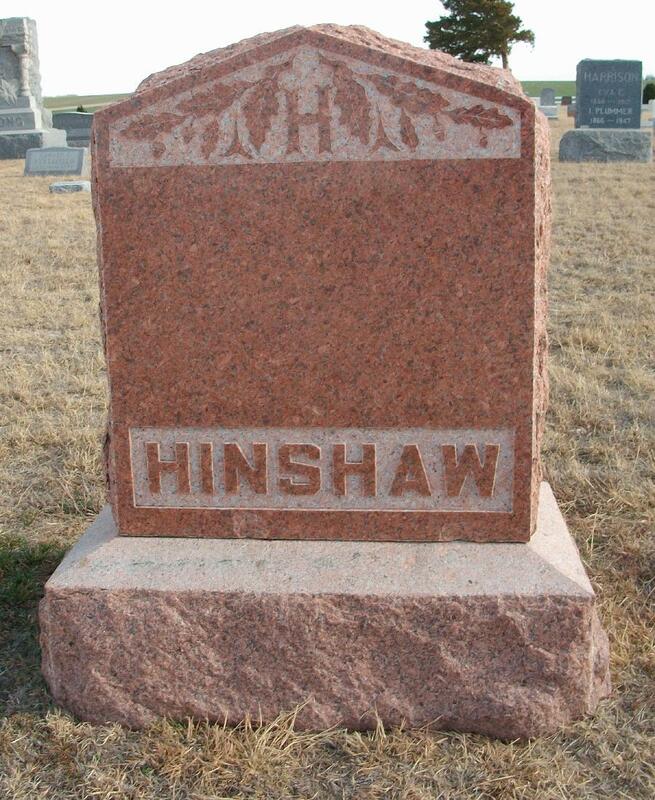 Hinshaw, Adonna, son [sic], male, age 12, born Sept 1887 in Kansas; parents born in Indiana; attended school 4 months. Hinshaw, Robert D., son, age 9, born May 1891 in Kansas; parents born in Indiana; attended school 8 months. Hinshaw, Philander, head-of-household, age 63, born in Indiana; parents born in North Carolina; first marriage, married 38 years; occupation: own income; owned home (free). Hinshaw, Emily Jane, wife, age 61, born in Indiana; parents born in Indiana; first marriage, married 38 years; 10 children, 9 living. Hinshaw, Evelyn, head-of-household, age 53, born in Indiana; parents born in New York; divorced; owned home; occupation: none. Hinshaw, Philander E., father-in-law, age 73, born in Indiana; parents born in North Carolina; [..marital status unclear..]; occupation: none. Note there is a discrepancy between the reported death date above and the 1920 census enumeration above, which was recorded two days after Philander reportedly died - it's possible there might have been a census error, or perhaps this death date is incorrect. 1900 census, Lincoln Township, Edwards County, Kansas; roll T623-478, ED 37, page 3B, line #78, dwelling #150, family #151. 1910 census, 2nd Ward, Pratt, Center Township, Pratt County, Kansas; roll T624-453, ED 133, page 81B, line #95, dwelling #456, family #469. 1920 census, Fowler Township, Meade County, Kansas; roll T625-541, ED 122, page 10B, line #74, dwelling #230, family #232. 1870 census, Winchester P.O., Wayne Township, Randolph County, Indiana; roll M593-354, page 485, line #33, dwelling #329, family #335. 1900 census, Ness City, Center Township, Ness County, Kansas; roll T626-493, ED 160, page 3A, line #30, dwelling #54, family #58. RootsWeb WorldConnect data by Carrol Mick (). 1920 census, Pratt City, Pratt County, Kansas; roll T625-545, ED 156, page 11B, line #67, dwelling #228, family #284.